No matter where you live in northern Michigan, the most important thing to know about stroke is this: If you or someone you love shows signs of stroke, call 911 immediately. Do not delay and do not drive to the hospital. EMS personnel can perform a preliminary exam in the ambulance and provide key information to the hospital so the emergency team is ready for your arrival. Stroke is a medical emergency. It is a brain attack and happens when blood flow to an area of the brain is cut off. Brain cells deprived of oxygen quickly begin to die, which can result in temporary or permanent loss of speech, movement, vision, balance, and memory. Munson Healthcare hospitals in Cadillac, Charlevoix, Gaylord, Grayling, Frankfort, Kalkaska, Manistee, and Traverse City have protocols and processes in place to quickly diagnose and evaluate a stroke. Munson Medical Center’s Stroke Program is recognized as a regional stroke center for northern Michigan and has been certified as a Primary Stroke Center by the Joint Commission since 2012. The Stroke Program has been repeatedly recognized by the American Heart Association and American Stroke Association for high quality care. 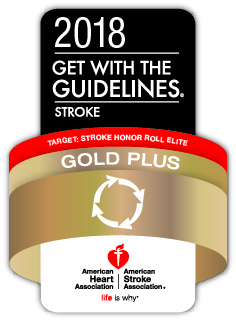 Munson Medical Center received both Gold Plus Award and Target Stroke Honor Roll Elite recognition from the national association in 2018 for achieving quality standards. Munson Medical Center’s dedicated stroke unit is staffed by clinicians with specialized training to meet the needs of stroke patients. A fast and effective response is critical for stroke treatment and recovery. Use of a clot-busting medication for eligible patients called Alteplase (tPA) taken soon after the onset of symptoms helps prevent or limit disability following a stroke. When a patient has a stroke, expert medical attention is needed immediately, so it is critical to be fast. A multidisciplinary team works together to provide the best care possible, from arrival at the Emergency Department, through treatment, rehabilitation, and recovery. The team includes two board-certified neurohospitalists who oversee care of stroke patients in the hospital and are available around the clock for consultations. Rehabilitation can begin immediately while the patient is still in the hospital. Before a stroke patient leaves the hospital, a case manager will meet with the patient and caregivers to talk about home care and outpatient rehabilitation needs, making sure the patient has all of the care and services needed to continue healing and recovery. Rehabilitation services are an important part of recovery and are available at all Munson Healthcare hospitals in Cadillac, Charlevoix, Frankfort, Gaylord, Grayling, Manistee, and Traverse City. Our multidisciplinary rehab teams take a patient-centered approach and work together to ensure the best possible outcome. To learn more, visit these trusted online resources.